This is a great lightweight skate with a detachable composite chassis that was specifically designed to meet the manufacturer's rigorous standards of performance. The chassis was designed to withstand high-impact stresses, enormous dynamic loads, exposure to dirt, water, and weather. And of course, because the Vario uses the same structural design as Hypno's other skates, you can use the same wheels, bearings or brake pads as any other Hypno Skate. All in all, this is a really nice skate. For men's sizes, one full size larger than your regular shoe size. For women's sizes, one half size larger than your regular shoe size. Please Note: Although these are new skates, due to their age (2006 model), some skates have discoloration on the white trim of the boots. these skates are just great, I don't know what I would do without them :) thanks Hypno. Hypno skates are perfect for beginners; you know longer have to be worried about hills and stairs – just take the skates off and walk until you become comfortable to skate again. The skates are great if you decide to stop at a store, a friends place, or simply catch a bus without the worry of having to take off your skates or pack extra shoes. The only downfall are the lace hooks and the Velcro straps – the hooks should be either stronger or holes so you don’t feel that you are going to break them. The Velcro strap should be something other than Velcro because the Velcro loosens and there is too much strap left over when you tighten it well. 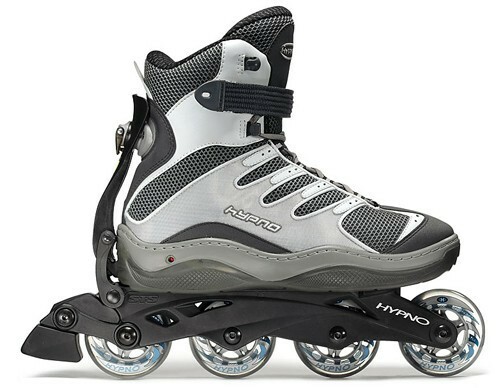 Overall, I would buy them again especially if the fastening was improved – I think if Hypno can introduce wheels that can come off a skate, they can introduce an innovative way to fasten them differently as well. Um... I bought mine six months ago and these skate are incredible. Hills aren't a problem, stairs aren't a problem, and when you skate to the mall and the security guy outside tells you you can't go inside with your skates on, you can take the wheels off. I know I've already given these skates at least a year or two's worth of extra damage from weather use, and from just skating and crashing, and I can say these skate hold up very well. They hold up against serious weather conditions. There was a time I remember when I was at a fair, and it started raining and thundering. When I got home I checked the skates. The only thing that happened was a very small bit of puffiness in the light gray fabric,and when it dried, it was practically gone. About the locking system,The only thing that is sort of an issue are the laces. Getting the skates tight enough can be a bit of a problem. The only thing I recommend to Hypno is changing the lace-up locking system to something else, like a lower buckle-clip or something. I really like the versatility of these skates. On 1999 I belonged to the recently created Skate Patrol of Puerto Rico Police Department.The Government bought "Rossignol".Rossignol were not specialized in Skates they were specialized in Snow Skies,board etc. One of Us found out Hypno "Raptor" at the Internet and Bought them.We all changed with our own Money to Hypno because they were Light,Faster,Durable,Strong and didn't break easily like Rossignol.I will never buy another brand while Hypno still exists. Hypnos have completely changed the way I commute in the city. I hardly ever take the subway anymore and have found out that on short to medium distances, I'm actually faster on skates than with any other means of transportation. Thank you Hypno... just wish you would build a shoe for summer with better ventilation. I've been researching and waiting for some time for a truly viable "switchable" model for some time. I’m so glad I stumbled onto Hypno. I got the “full whack”; Vario boots, AL chassis and ice skates (since my kids are into that). Sizing and fit: I was very relieved when the sizing recommendation for the boots was right on. I average a size 12 shoe, and the size 13 boots fit me just right. The support feels good, and the shape of the interior (good arch) actually took some getting used to, combined with the fact that I have not been skating nearly as much as I used to. This is my first soft boot, and that has taken some getting used to. So far, it seems I have to retighten after the first five minutes, then I’m good to go. The laces do add to the look of a street shoe. I am somewhat worried about the longevity of the lace loops I plan on these being my last set of skates and I’m wondering if those loops will last more than a handful of years (my last set of rollerblades lasted 15 years). I wouldn't want to walk miles in these boots, but they are adequate for malls, trains, buses, restaurants, etc. Attachment system: I am very impressed with the simplicity and security of the attachment system. It attaches quickly and holds absolutely, with no wobble at all. However, putting the blades attachment on that has the brake is a little more of a fiddle than the one w/o brake. Perhaps that is something I will get used to. One should wear gloves when donning and doffing the ice skate attachments, since they are sharp. Function as inline skates: I’m pretty happy with the inline skates. This is the first time I’ve had an AL chassis, so that took some getting used to. The alignment and solidity are tops. Anyway, I love these, they are just what I’m looking for (a commuter set of skates for here in Japan) and I wish I could find some ladies version for my wife. Those no longer seem to be available, but I’m still looking. >The locking system is solid. There is no wobble, no worry at all. There is plastic in the system, but the key components are reinforced with thick steel plate. >The extruded aluminum chassis is also very solid, and very thick. I really can feel the difference with the 80 mm wheels. Watch out, though, it has sharp edges. >The boot itself is nice and rigid, although it has a little more "give" above the ankle than I am used to. No hot spots, no blisters, no problems. My feet got a little tired after 3 hours of non-stop high speed skating. Feet stayed nice and cool. >It might be just me, but it seems like I can't lean as much into turns before the boot touches the ground, as I could on other skates. Not fun to suddenly come to a stop in the middle of sharp turn. >The tread is really smooth. I wouldn't wear these if the ground is slippery, but it has good grip on most surfaces. Wet ground is what I'm most concerned about. >The boot itself is extremely comfortable, although a little clumsy to walk in. It's similar to walking in a ski boot, as you can lean forward slightly, but not back at all. It makes going up and down stairs or running a hassle, but fine for walking in. >Don't try driving with the boot on. >The lacing loops worry me a lot. They don't seem very strong, and I'm worried they might break if I pull the laces really tight. I don't know how I would fix the boot if a loop got torn out. >I don't know how long the sole lasts, and I wonder if the sole can be replaced if it gets worn down, or if I just need to buy a new boot. It's less than 1 cm thick before the actual chassis locking mechanism. >There are a LOT of stitches on the boot. I look at it and see a lot of things that could break. The stitching seems solid, but I'll have to come back to update and see how it is holding up in a few months and then a year or two. In conclusion, I'm very very pleased with the skates. They are very comfortable, and very fun to use. Everyone at the rink was interested in them, and I really enjoyed being able to take the wheels off and walk around when I wasn't skating. I think I have some valid concerns about the durability of the boot itself, but only time will tell how well they hold up. I'm happy with what I got for the money I spent, and I may even buy the ice blades come winter. Update: Boots are still good after 6 months. Nothing is broken, nothing is rattling. Two things I would do differently: First, the brakes are terrible: way too soft and wear out too fast. Second, I would not have gotten the aluminum chassis with 80mm wheels. They are really nice and blazing fast at the rink, but outdoors they are just way too smooth to take on hills. The boot construction is still strong and in good condition. Purchased this product for Christmas and it was received in poor condition. I have contacted the company via email as that's the only contact information provided and no response has been received as of yet. I have now filed a compliant with the Consumer Agency. I would advise seeking other resources for purchasing hypnoskates if you need or want this item. My top strap broke when i was putting my skates on. They work well, but my strap broke and now I can't use it. i only used it for half a month.